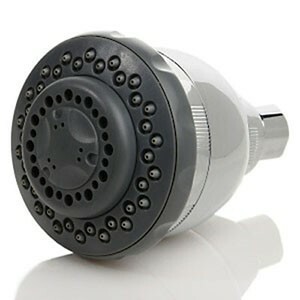 The Paragon Fixed Shower Filter Head simply replaces your existing wall mounted fixed shower head. It works like your drinking water filter does, filtering out chlorine, reduces scale, harmful chemicals, leaving you showering in pure filtered water. The Paragon Fixed Shower Filter Head simply attaches to your existing shower pipe. For those who have a fixed shower head attached to a shower pipe, simply remove your existing shower head and replace with this water saving shower filter. It works like your drinking water filter does, filtering out up to 99% chlorine, reduces scale and harmful chemicals, leaving you showering in pure filtered water. Filtered water is much easier on your skin and hair, alleviating dryness and itchiness. The glamorous shower filter head has been independently tested and certified by the NSF (an international consumer standards organisation). Try it today, you will feel the difference or your money back. When the tap water flows through the Paragon Filter system it filters the water through the Media 41 & KDF filter (white block), giving you the best shower filtration system available. The Paragon Fixed Shower Filter Head is extremely easy to install, without the use of any tools. It will fit all standard shower configurations, if you have any queries in relation to it fitting please email us from the Contact Us page. Remember we have a money back guarantee if the shower filter does not fit your shower, but please do send us an email first if you are unsure. Shower Head Filter is intended to be used with existing fixed shower wall / ceiling pipe. Attaches to any standard off wall / off ceiling shower pipe (water outlet pipe should have a diameter of roughly 22mm). 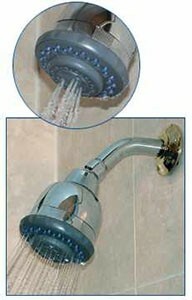 Remove existing shower head from shower pipe by turning counterclockwise. Attach new filtered shower head onto this same connection on the shower pipe and tighten by hand turning clockwise. I am delighted with my order. I purchased the Paragon Luxury Shower Head Filter and 8 Stage Luxury Shower Filter. They certainly make a difference. The ordering process was very easy and delivery was as planned. Good service overall! I live in student hostel in London. the water is rough on my skin, and my hair. 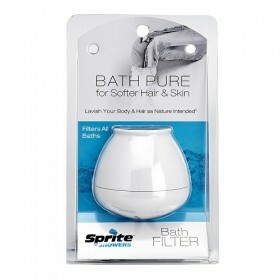 I ordered the head showers it helped a lot especially for my hair. I needed to replace the shower head for my daughter`s university halls shower as she suffers with eczema and the uni is in Egham- a very hard water area, which was causing her problems. the shower was a vandal proof wall mounted unit- so not a straight forward swap, so I contacted the pure showers team to ask if they thought this was possible, they responded quickly, and although they thought it probably wouldn`t fit, they supplied a fitting arm with the unit free of charge, and the plumber was able to fit it without too much trouble. the filter has certainly helped, it`s not quite as good as a proper water softener, but a definite improvement and worth having. thank you to the team- you were very helpful. Nice shower filter and head. Very quick, efficient delivery. Enjoying the shower experience, definately helped. We love our shower head its fantastic great water pressure and cant wait to start benefitting from the positive health effects! I would give you 5 stars: the service was excellent just like the product. Keep up the great work. I live in a hard water area in Kew Gardens,Surrey and since replacing my shower head with your pure head filter shower head I have noticed a huge difference in the condition of my hair and skin.This is a great prouct.It is simple to install ,good value and works exceptionally well. Your service was impeccable, I got the showerhead way before I expected it to arrive. The showerhead is great with its different functions.